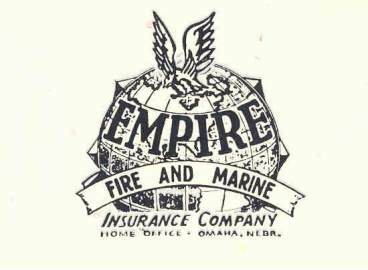 Beautifully engraved certificate from the Empire Fire and Marine Insurance Company issued in 1972-73. 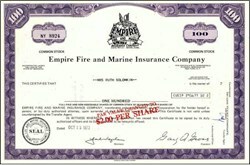 This historic document was printed by the American Banknote Company and has an ornate border around it with a vignette of the Empire Fire and Marine Insurance Company logo. This item has the printed signatures of the Company�s President and Secretary and is over 28 years old. Empire Fire and Marine Insurance Companies provide tailored insurance and financial solutions to small and mid-sized commercial markets. They focus on a variety of vehicle exposures including long-haul trucking, ambulance and tow truck companies as well as rental and/or dealer operations for autos, recreational vehicles and contractors' equipment. Empire also targets unique general liability risks, such as tanning salons and security guard companies. Empire also targets unique general liability risks, such as tanning salons and security guard companies. Empire holds an A+ rating from AM Best for management and financial success and is continuously named to Ward's 50 benchmark group for outstanding financial results. Empire has experienced substantial premium growth, with a generated annual revenue of approximately $16 million. Incorporated in 1954, Empire employs nearly 500 people.